Osmanthus is the name of an entire genus of evergreen flowering shrubs and trees originating predominantly from East Asia. They are related to the olive tree, along with the privet and the forsythia, to name a few. There are a couple of cultivars and varieties that are used as hedging plants, the most common of which are the osmanthus heterophyllus and the osmanthus x burkwoodii. The former is an independent species within the osmanthus genus which, due to its similar appearance to holly, is also known as false holly or holly osmanthus, while the latter is a hybrid of two different species of osmanthus: the osmanthus delavayi from East Asia and the osmanthus decorus, which originates from northeast Turkey. 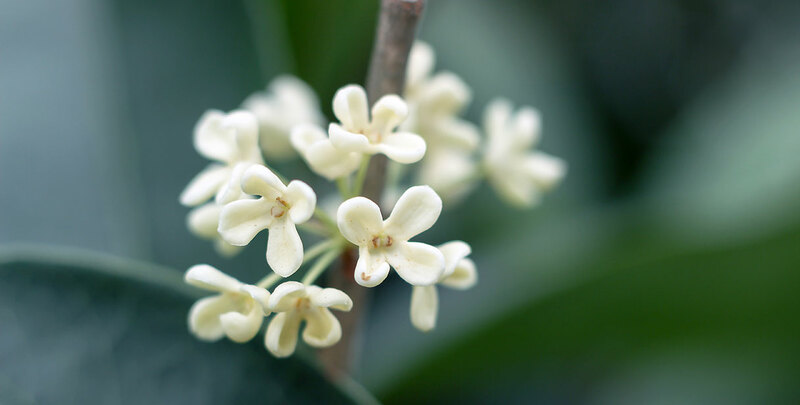 Since both types of osmanthus do not grow very dense or tall – they rarely reach a height of over 1.50 metres – they are perfectly suited to plant in your front garden. An osmanthus hedge will certainly not block the sunlight from your windows and it will also allow you to still see what is going on outside. One of the main reasons why people choose to plant an osmanthus hedge, however, is its winning combination of thick, spiny, leathery dark green foliage and pleasantly fragrant white flowers that appear in late summer or autumn. These flowers are followed by dark purple fruits in the summer. Due to this appealing combination of colours and smells, osmanthus hedges are rapidly increasing in popularity. There are over 30 different osmanthus species, most of which occur in Southeast Asia, from where the genus originates. In these regions, the sweet, fragrant flowers are used as a spice or as an ingredient to make green or black tea. Several osmanthus species even produce berries that can be used to produce jams or liquors. Due to their relatively limited height, osmanthus species are not traditionally used as hedging plants, but that does not mean that they are not suitable for hedging purposes. In fact, the two species that we describe on our website are excellent evergreen hedging plants that will make your garden look a little more colourful throughout the entire year. Coming home to the sweet smell of their flowers is quite a pleasant experience as well. Not only humans are attracted by the fragrant flowers of the ostmanthus, however. Insects such as bees also really like these flowers and therefore, these small animals will certainly look forward to visiting your garden. As a result, your garden will have a lively, pleasant look. There are a few noteworthy differences between the holly osmanthus and the osmanthus x burkwoodii. The burkwood osmanthus, as the latter is commonly called, flowers earlier than the holly osmanthus. 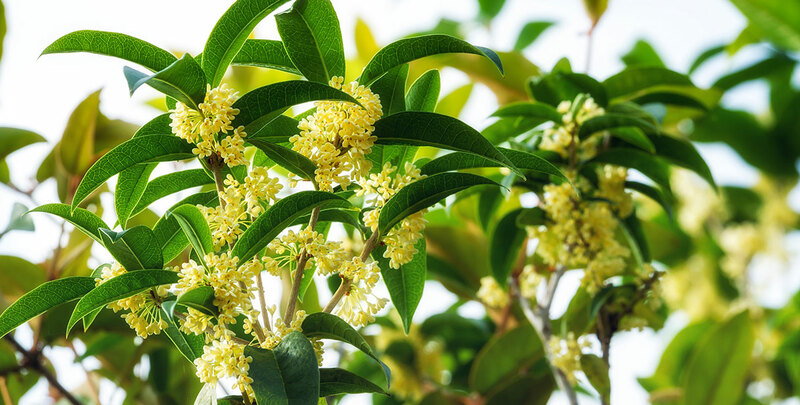 These flowers are even more fragrant than those the holly osmanthus produces and may appear as early as mid-spring, while holly osmanthus usually waits until autumn. Finally, the burkwood osmanthus has more finely toothed foliage and does not resemble holly. Both types of osmanthus are slow-growing, compact, medium-sized and perfect for both borders and low hedges. They are fairly hardy and happy growing in any fertile, well-drained soil. 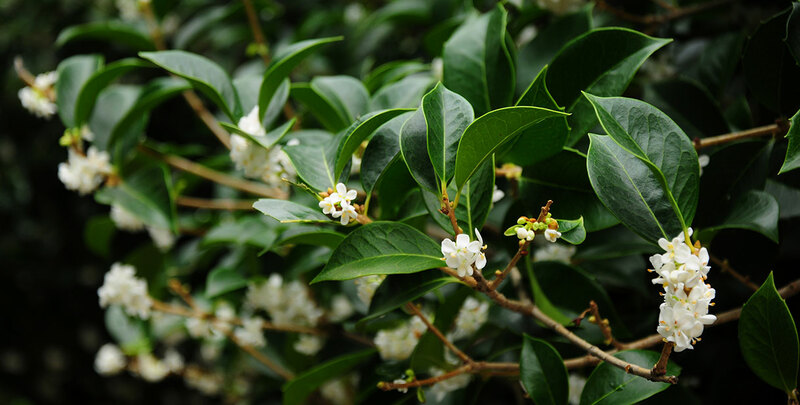 Osmanthus species can tolerate all degrees of exposure to sunlight, although we strongly advise you to avoid deep shade, as well as exposed locations. Beside their handsome appearance, osmanthus hedges are also appreciated for being very low-maintenance, as they need very little pruning. They tolerate pruning very well, however, and they can be clipped any way you like. Just make sure to leave the fragrant white flowers on. In addition, we advise you to wear protective clothing and gloves. Especially when pruning a holly osmanthus, as the spiny leaves of this species are likely to leave scratches otherwise. Speaking of these leaves: only the younger leaves of a holly osmanthus are very spiny. Older leaves have smooth edges or are only very lightly toothed. The name “false holly”, of course, refers to the fact that this species is not actually a part of the ilex genus. True holly can be recognized by having showy red berries and more glossy leaves than false holly. Because of this, false holly also is not used as Christmas decoration like true holly is, but that does not make the osmanthus species any less ornamental. In fact, this means that both of these osmanthus species have a unique character of their own. They will create hedges that will certainly make your garden stand out. Are you looking for a hedge that does not only look great, but also smells great? In that case, an osmanthus hedge might just be exactly what you are looking for. Holly osmanthus and burkwood osmanthus make excellent low hedges that are attractive to humans and insects alike. 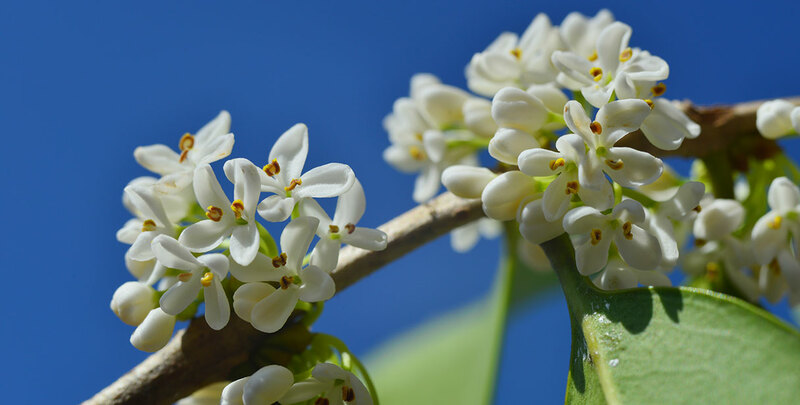 They will not block the sunlight from entering your garden and your house, but they will certainly make your garden look a little livelier with their beautiful green foliage and their fragrant white flowers. In addition, the fact that they require very little maintenance makes an osmanthus hedge a simple case of all gain for only very little pain. And even the pain can be eliminated by using protective clothing. We are surprised that osmanthus hedges have not been popular as they are becoming all along, as the species described on our website have excellent hedging qualities. As a result of this relative obscurity, an osmanthus hedge will certainly make your garden stand out. If that is what you are after, be sure to plant one quickly, as we expect a rise in the popularity of this species very soon.